How to Open the SUM Function? How to Use SUM Function? 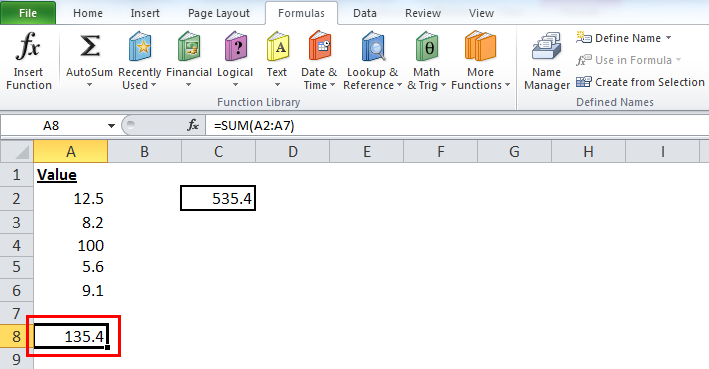 The SUM in Excel is a built-in function which adds all the numbers in the range of cells and returns the result of the addition. It is categorized as a Math/Trig Function in Excel. 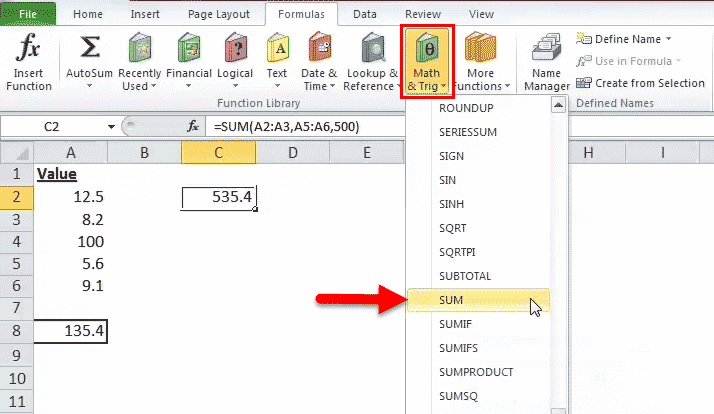 The Sum Function can be used as a worksheet function and can be entered as a part of a formula in a cell of the worksheet. The Sum function will return the sum of the values which are entered as multiple arguments. A total of 255 individual arguments can be handled by the Sum Function, which can include cell references, numbers, ranges, arrays and constants. Number- A numeric value which you wish to sum. Number1 is required and Number2 till Number_n is optional. You can add up to 255 arguments. Cell– The range of cells which you wish to sum. The first range of cells i.e. cell1:cell2 is required. Cell3:Cell4 and so on are optional. Return Value: The Sum Function in Excel returns the sum of values supplied. The return value is a numeric value. The mappings dimensions must be the dimensions of the source line item. The resulting line must be number-formatted always. The Sum Function sums all the values which are supplied as arguments and up to 255 arguments. These arguments supplied in the SUM formula can be numbers, arrays, cell references, arrays, constants and the results of other functions or formulas. For example, SUM (B1:B3) adds all the numbers which are present in the cells B1 through B3, which equals to the return value of SUM (B1, B2, B3). The Excel’s built-in formulas can be expanded, if you nest one or more functions inside some another function in a formula. The effect of these nesting functions will permit multiple calculations for taking place in a single worksheet cell. For doing this, the nested function acts as one of the arguments for the main or the outermost function. For example, let’s nest the SUM function inside the ROUND function. Find the sum of the value in cells A1 to A6. Round this result in three decimal places. A total of 64 levels of nested functions are permitted since Microsoft Excel 2007. Before this version, only 7 levels of nested functions were allowed to use. How to Open the SUM Function in Excel? You can simply enter the desired SUM formula in the required cell to attain a return value on the argument. You can manually open the SUM formula dialogue box in the spreadsheet and enter the values to attain a return value. 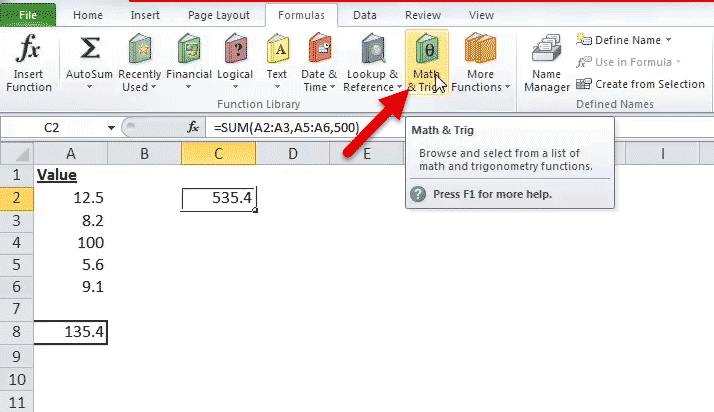 To open the SUM formula dialogue box, go to the ‘Math & Trig’ option under the Formulas Section in the Menu Bar. Consider the screenshot below. Click on the “Math & Trig’ tab. A drop-down menu will open up, from which you have to select the SUM option. See the screenshot below. 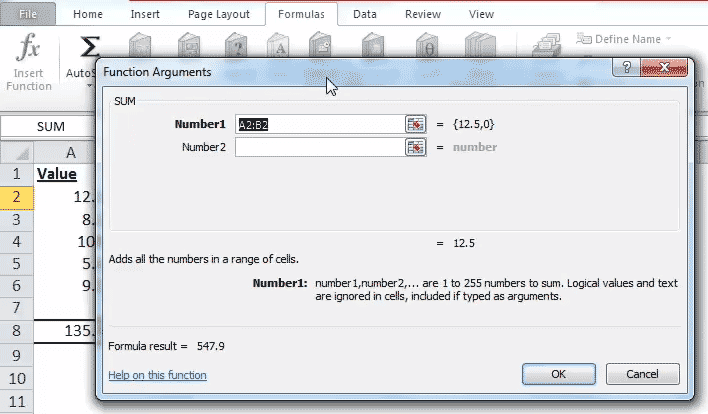 Once you click the SUM option, the SUM function arguments dialogue box will open, where you can put the arguments and attain a return value for Excel SUM function. Consider the screenshot below. The quickest way to add up the numbers in a range of cells is to use the AutoSum button. It will automatically enter a SUM function in the selected cell. The SUM will total one or more than one numbers in a range of cells. Let’s see the method below. 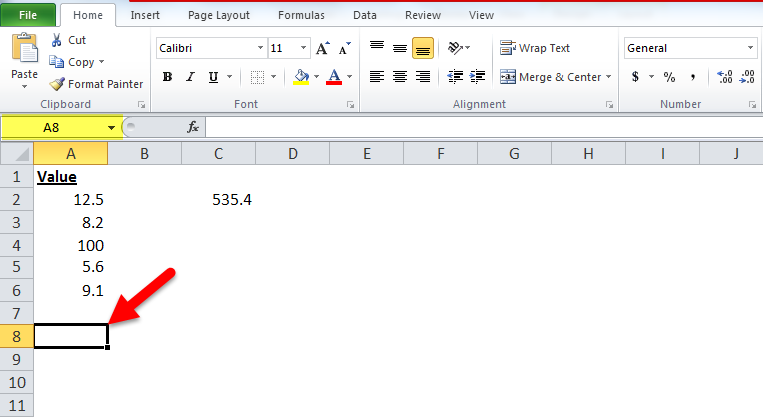 Select the blank cell in the row below the cell which you need to sum, cell A8 in the below Excel SUM Function example. Now, click AutoSum command on the Home tab. You can also use the keyboard shortcut: Alt + =. You can see that an Excel SUM formula will be appearing in the active cell, with reference to the cells above. You can press the Enter key to complete the entry. See the screenshot below. 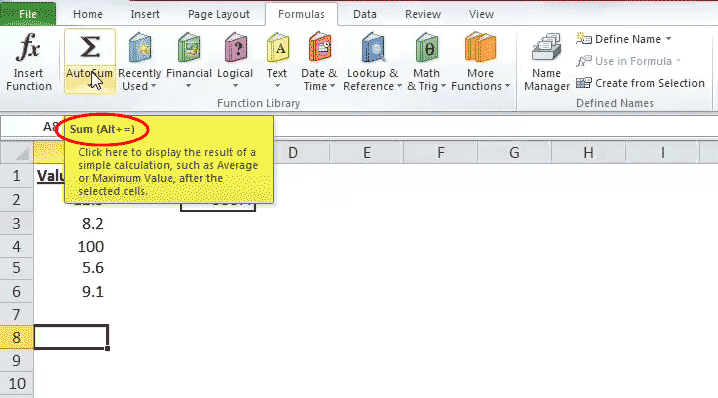 Let’s look below at some of the examples of SUM function on Excel. 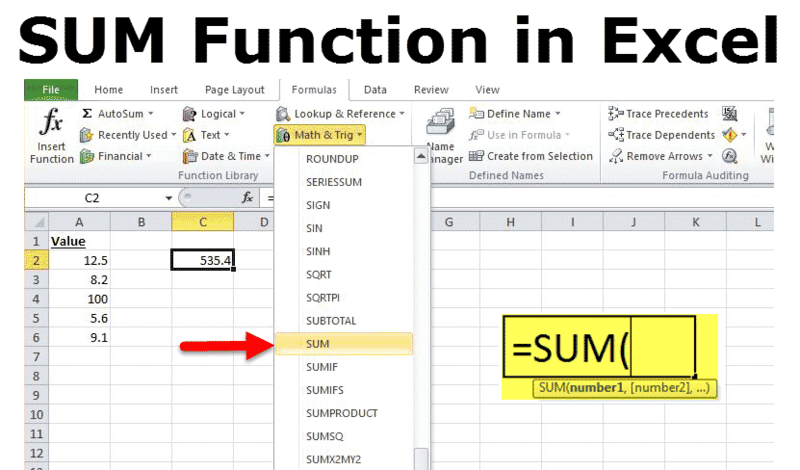 These Excel Sum Function examples will help you in exploring the use of SUM function in Excel. Consider the excel spreadsheet below. You can see the excel spreadsheet below. #VALUE! Error – It occurs when the criteria provided by you is a text string which is more than 255 characters long. The easiest way for applying the SUM function is that you can simply select a cell next to the numbers which you need to add and click on AutoSum on the Home tab. 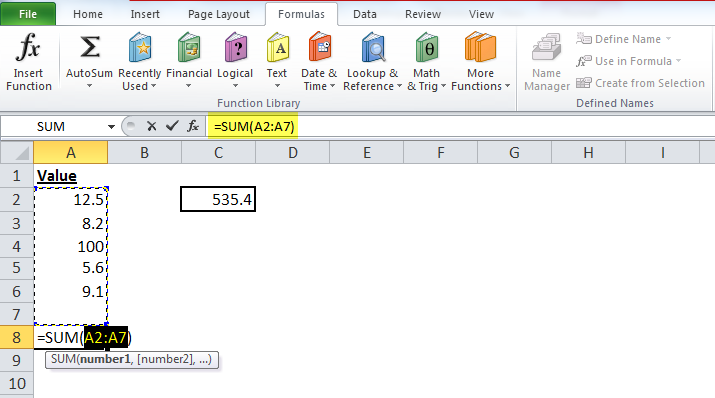 You can then press the Enter key and the Excel SUM formula will be inserted automatically. How to Insert Date in Excel with examples? How to use the Excel Fill Handle from keywords?